Jeff Lemire's Blog: New Sweet Tooth Art, Superboy Reviewed and more! New Sweet Tooth Art, Superboy Reviewed and more! Superboy #2 (Published by DC Comics; Review by Teresa Jusino): I’ve said it before, and I’ll say it again: superhero titles that prominently feature teenagers are superhero titles at their best. The issues of identity and responsibility that come up in superhero comics are perfect metaphors for fumbling one’s way to adulthood. In the second issue of this wonderful new series, Superboy is forced to team up with Poison Ivy to solve the mysterious problem of overgrown plant life devouring Smallville. What makes this issue work is writer Jeff Lemire’s focus on Connor Kent’s relationship with his best friend, Simon, who has been begging Connor to allow him to be of help. When Simon rushes in to save the day by use of “Parasite frogs! Patent pending”, you know that these two boys are an excellent team. Lemire imbues this title with loads of humor, which is a change from his more serious-minded Sweet Tooth, and it’s interesting to watch Connor struggle with his new responsibilities and with wondering whether he should take his friend along for the ride, possibly endangering him. However, it’s clear that Simon’s intelligence is not to be underestimated, and I look forward to watching him and Superboy work together to fix an ailing Smallville. 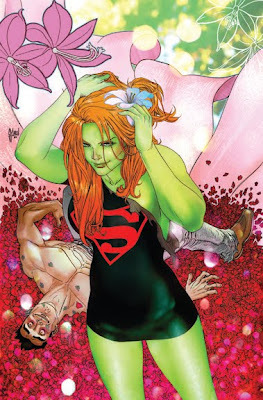 And also, the first ever North American interview with Superboy artist Pier Gallo over at CBR! And a brand new SWEET TOOTH interview at CBR as well. 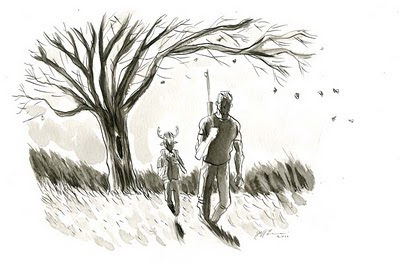 And...A new Sweet Tooth blog with never before seen cover sketches over at GRAPHIC CONTENT. And finally congrats to Lisa McCarty who won the new SWEET TOOTH drawing, featured above, off of my Twitter feed this morning!